Shark Diver : Shark Diving : Swimming With Sharks: How do you make a viral video? This is a fun little video I took at Tiger beach, diving with Shark Diver. Little did I know that it would be a hit on Facebook. Within an hour of posting it, people watched it over 20'000 times. Come join us and take your own pictures and videos and maybe yours will goes viral as well! 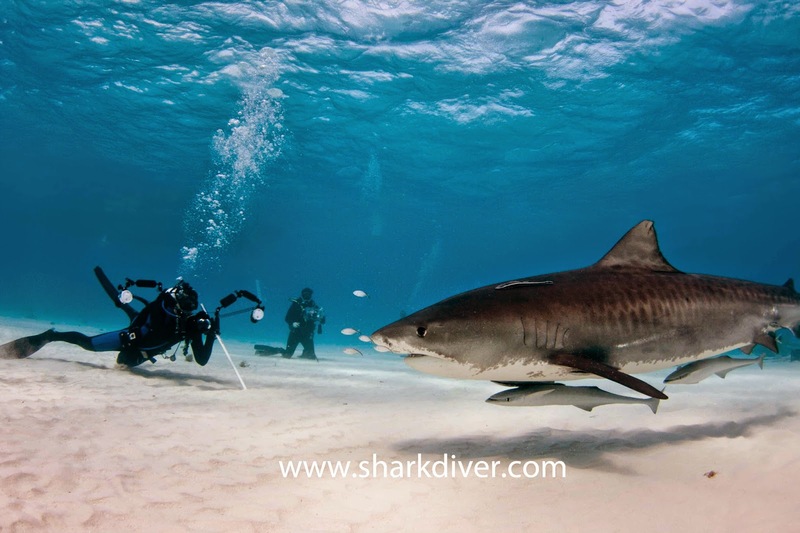 Of course, we don't just encounter Lemon Sharks, we see plenty of Tiger Sharks as well. This is truly a trip of a lifetime! Since we only take 6 divers at a time, you'll be sure to get up close and personal with these amazing animals. For more info on the trips and a complete itinerary, check here, or you can call us at 855.987.4275 or 619.887.4275 We are always happy to talk "sharks"!